This media cabinet is the embodiment of understated elegance. The white oak drawer fronts provide a beautiful neutral backdrop for a brushed nickel grille overlay. 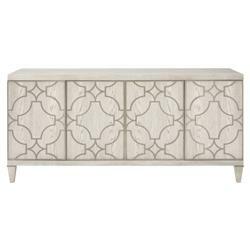 This piece, with its ample storage, will bring a touch of Hollywood elegance to any space.